If you follow your nose (which always knows... the flavor of fruit) which cereal would it lead you to? 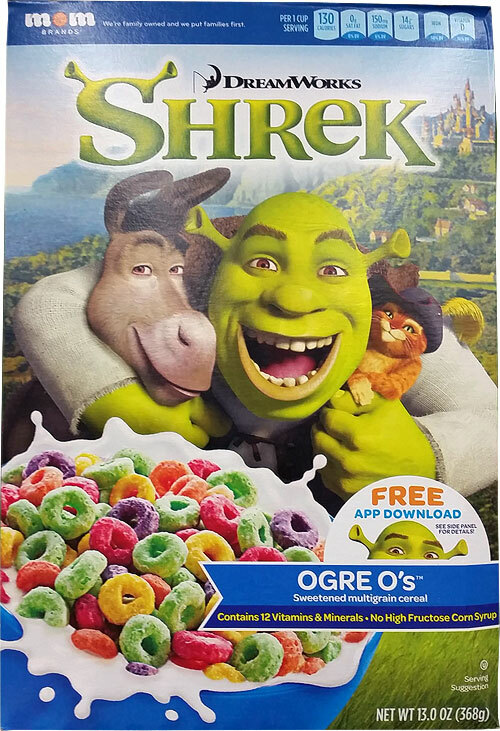 The complete name of this cereal is DreamWorks Shrek Ogre O's. It's described on the front of the box as a "sweetened multigrain cereal (which) contains 12 vitamins and minerals (and) no high fructose corn syrup." 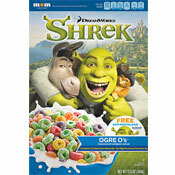 A description from the Mom Brands website says, "Now you can invite Shrek to breakfast with new Shrek Ogre O's cereal! Crunchy, fruity and tasty with lots of green ones!" The cereal looks remarkably like Kellogg's Froot Loops cereal. The first 5 ingredients listed on the nutrition panel are corn, wheat and whole grain oat flour, sugar, corn syrup and salt. The animated film Shrek from DreamWorks debuted in 2001. The film spawned 3 sequels: Shrek 2 (2004), Shrek The Third (2007) and Shrek Forever After (2010). A spin-off called Puss In Boots was released in 2011. By our count, this is the 4th Shrek cereal to be produced by a major cereal company. Kellogg's gave us Shrek Cereal in 2007. General Mills offered Shrek's (Not Donkey's) Cereal in 2004. In the U.K., Nestle came out with Shrek 2 Mud & Worms Cereal, also in 2004. Click here to see all cereals from MOM Brands. What do you think of Shrek Ogre O's? I got too excited when I saw the brand name. I instantly bought them. Unfortunately, I got severe hay-fever and wind. I was not happy. Shrek is love. Shrek is life. This is the best cereal I have ever eaten. The flavor is to do die for and this is simply a masterpiece. Simply thinking about this delicacy makes my mouth water. 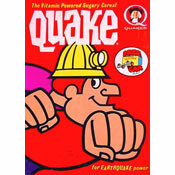 I hope they make this cereal again. It was amazing. Just tasted like Froot Loops. No better. No worse. Maybe a little, tiny bit sweeter. I bought my son a box of these for Christmas... simply the best $3 I ever spent. Pretty good, but Fruit Loops are better. Bleh... pretty lame copy of Froot Loops. Not great.